Located on Museum Island, this brand new hotel residence Capri by Fraser is only a short walk to the famous museums in Berlins historic center. 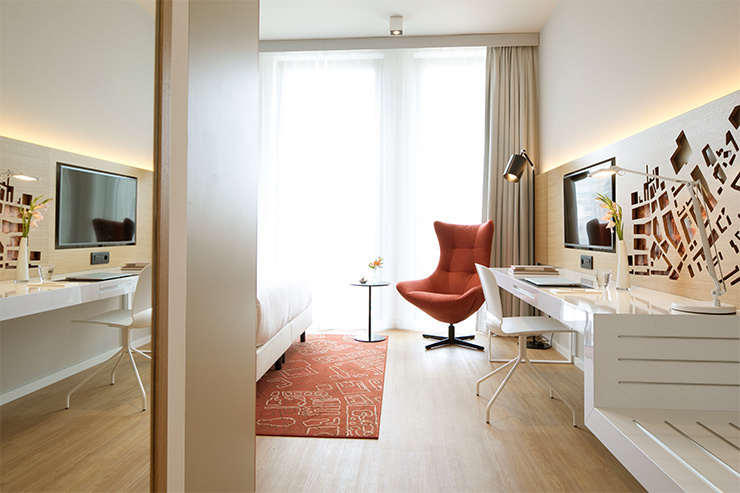 Guests can choose from 143 stylish serviced apartments, ranging from studios to one-bedroom units. 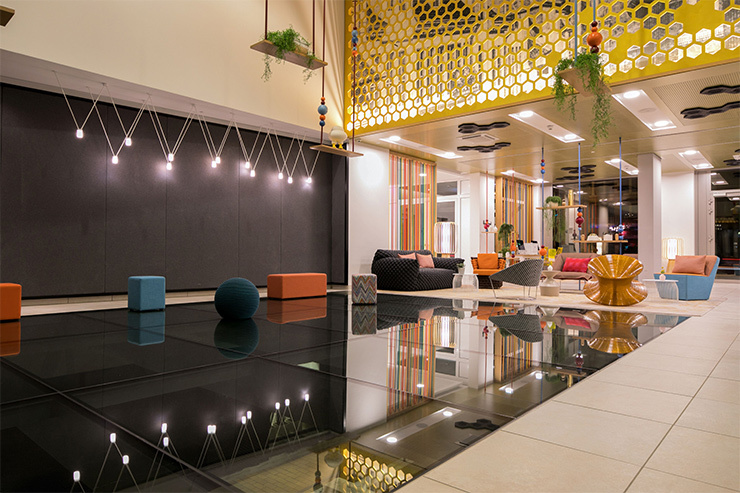 Its interiors are true to Capri by Frasers’ brand of fun, playful apartment hotels for plugged-in, globetrotting professionals that also have a strong sense of place. Layered patterns recur throughout the hotel’s interiors, including the lobby seating groups where rugs are decorated with hexagon blocks and stenciled art employs superimposed circles to inject creative energy. 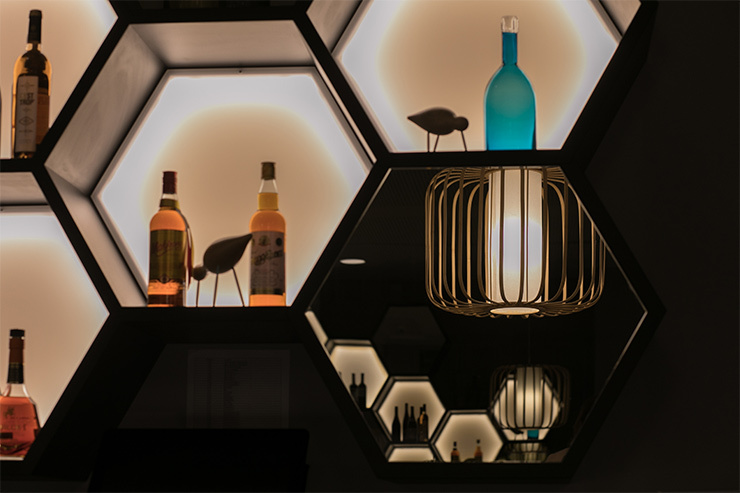 The Design Team by JOI DESIGN and Lichtvision had chosen decorative lighting that had emphasized the interior concept’s playful spirit and echo other elements within the design. 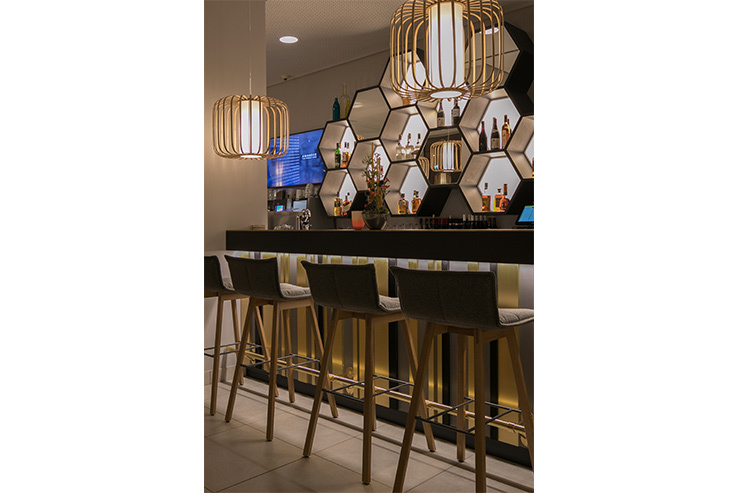 Moolin floor lamps and pendants surround seating areas in the lobby and illuminate the bar. Their bamboo ribbon shades cast lined shadows across the walls, a repetition of the patterns created by multi-colored strings hung from the doorways as an allusion to the graphic depiction of timelines. The special pendant lights suspended in a zigzag pattern also suggest the charting of time. Bespoke table lamps and pendants made from stacks of colorful globes emulate the lacquered spheres strung into the floor-to-ceiling shelving units. These shapes can also be seen in the quirky, contemporary artwork streamlining these elements within the design scheme. Working in close collaboration of interior designer and lighting designer the teams talked at length about technical planning, site-specific information and installation to develop seamless mood lighting for all public areas. The general idea was using decorative lighting fixtures designed in layers – an outer filigree layer or opaque material and an inner transluscent layer that hides the light source. 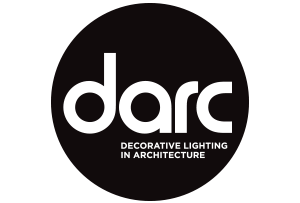 For the different rooms with their different functions, another style of luminaire type was proposed due to the fresh and young atmosphere following the overall design intent. The decorative lighting elements work as part of the furniture – it integrates into the young and vivid feeling, using fixtures that are en vogue, such as cage luminaires. The architectural lighting stands back in recessed ceilings and is as discreet as possible while decorative elements do as they are supposed to be giving the space an identity. The unique and humbling experience working on such an important historic site allowed finding the best setting of layers from heritage to contemporary design for a unique genius loci. The overall preserves and showcases the excavations, bringing Berlin’s origins into the design. The lighting and interior language reflects at the same time the values of the brand, which is young, fun and playful.